This board book makes a great shower/baby arrival gift. 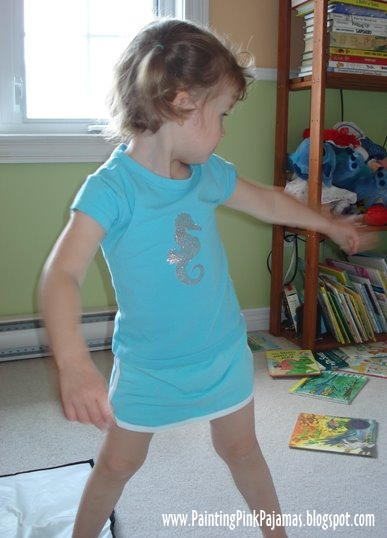 It's a sweet collection of Daddy/Daughter poems, and a couple of them are pretty funny! The diaper changing poem is the best - C can even recite it! A cute book about a Daddy teaching his daughter to ride her bicycle. We got it as a gift, but it seems hard to find (It's not on Amazon right now). I loved this book when I was little. In fact, C has my copy, complete with record! In this book, Little Critter and his Dad go camping. As always, Mercer Mayer's illustrations tell a different story than the words! There is a video based on this book, which we borrowed from our library. C loves seeing Little Critter sing! I bought this one for Hubby for Father's Day. It's about having fun just being together and doing ordinary things. This is a cute, short rhyming book that shows many different fathers doing fun activities with their children. I gave this one to one of C's friends on her birthday. In this book, the little girl imagines being a princess and her Daddy talks about how she'd be such a good princess, because she has character traits like honesty, helpfulness and sharing. Short bible verses are at the bottom of each page. I hope you had a wonderful Father's Day! I made these for C! I'm so happy with the way they turned out! The C shirt was super easy - an iron-on transfer that I picked up last year. I put it on a size 3 shirt so she'll get lots of wear out of it. The glittery seahorse and bird were made using fabric paint and a homemade stencil. I painted them on size 2 shirts, because I wasn't sure how they would turn out! And now for the instructions! It was pretty easy. Making the stencil was the most time-consuming part, but all in all, it didn't take more than 20 minutes, plus time for the paint to dry. I found out how to do it from Angry Chicken's (adorable) little elf shirt. Print the image that you want to use for your T-shirt (I did an image search for "silhouette"), and trace the image onto the paper side of the freezer paper (or trace the outline of a photo or a picture from a book - use your imagination!). 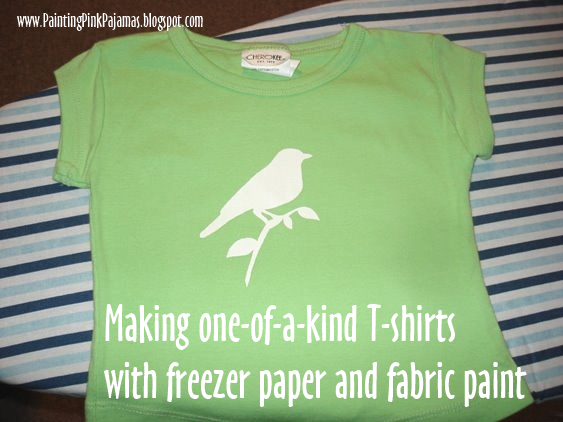 You could also cut your freezer paper into 8.5 x 11 sheets and run them directly through the printer. I haven't done a wash test yet, but I plan to wash the shirts inside out, hang to dry, and not iron directly over the paint. Let's hope it washes well! 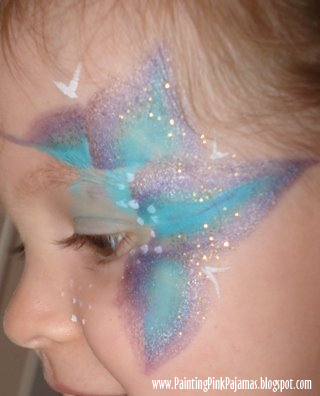 I've used regular and glitter paint, so we'll see the difference in how they look and wash. I'm a list girl. I like to-do lists, grocery lists, and especially lists of top things. The Bookworm's Booklist has posted a list of the 30 top children's picture books, and that's right up my alley. Here are the ones I've read with C so far. Except the 3 Little Pigs, we've read the highlighted books above many many many times, and C has memorized most of the lines! She goes around talking about climbing Corduroy's mountain, saying "we'll eat you up, we love you so" (like the wild things), and when we're baking she'll yell "milk, milk, milk for the morning cake!" (In the Night Kitchen was a gift for her first birthday and her first favourite book - we read it all the time, and still quite often!). C also often quotes Madeline (appropriately - her middle name). Oh, by the way, June 10th is Maurice Sendak's Birthday, so plan some fun activities! I've put The Snowy Day, Caps For Sale and Peter Rabbit in C's gift box, and she'll get them soon. Some of the others are on a wish list. There are a few on that list I've never heard of, though! How many have you read with your children, and what are your favourites? 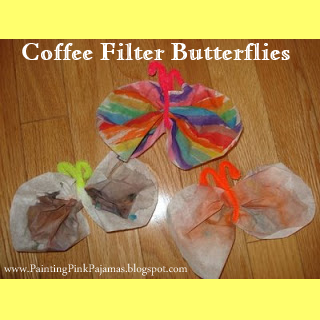 Last week, Katydid and Kid posted about her fabulous boredom bags, filled with activities to keep kids busy on trips, in restaurants, waiting rooms, etc. While clicking on the links in her post, I found the most fantastic website and I just had to share! I initially got excited about Hugo l'Escargot because it has thousands of colouring pages on almost every subject imaginable! Click through the coloured tabs to find subjects like cartoon characters, famous paintings, animals & nature, countries of the world, children of the world, Egypt, pirates, and so many more! The faces section is pretty neat too - kids can draw their own faces on the people on the colouring pages. The website is in French, bit it's pretty easy to navigate; there are icons for every section. Well, after exploring the site another day, I found some more gems! The songs section (chansons) has music files, lyrics and colouring pages related to each traditional children's song. Of course, the songs are all in French, but it's a perfect site for anyone trying to teach their child French! We live in New Brunswick, Canada, an officially bilingual province, so this will be helpful for us. On Hugo l'Escargot, you can also print stationary, birthday invitations, play online games (some of which are in English), view crafts & recipes, and other printables and cut-outs (including fantastic paper dolls of boys and girls. Print them on cardstick, paper, or give them a magnetic backing). A helpful hint: visit an online translator whenever you need a web page (or just a few words) translated. You can enter website addresses and it will translate a whole page at the click of a button. The grammar certainly isn't perfect, but it will give you the gist of what is on the page! So there you go, I hope you enjoy the site as much as I do! 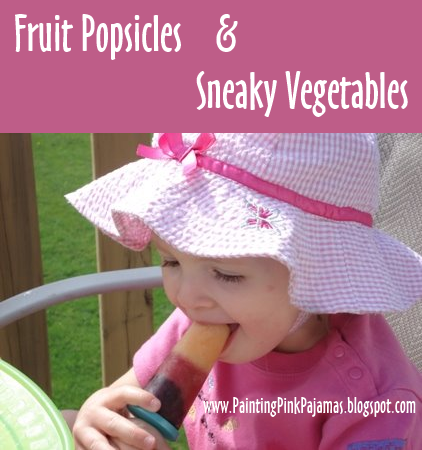 I was so excited when I saw all of the great activities that I think my husband thought I was a little bit nuts! We're going to lovely Prince Edward Island for a couple of days! According to About.com's Fun Days Calendar, today is Dinosaur Day, so teach your kids about dinosaurs today! Some facts I learned last week: the term "brontosaurus" is outdated - now it's "apatosaurus", and a "pterodactyl" is now called a "pterasaur"! Oh, how things have changed since I was a girl... 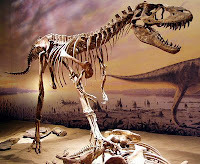 I loved visiting the Royal Tyrrell Museum of palaeontology in Alberta on school trips. I've been back once as an adult, and it's still the most amazing museum! Check out these virtual tours of the Dinosaur Hall. 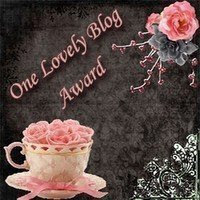 By the way, I want to thank Princess Mommy from Princess With a Half Price Tiara for nominating me for a blog award last week! 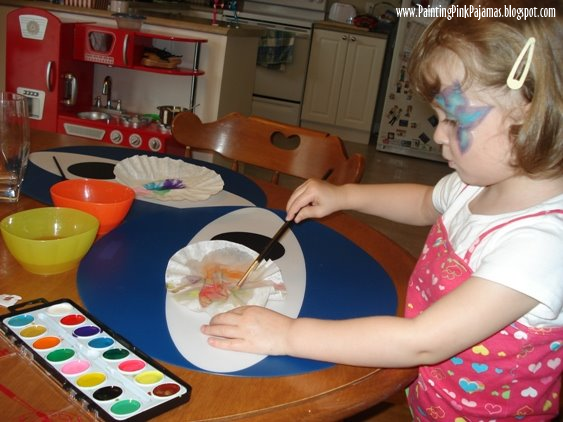 Check out her blog for preschool activities, budget-friendly tips & tricks, and crafts!